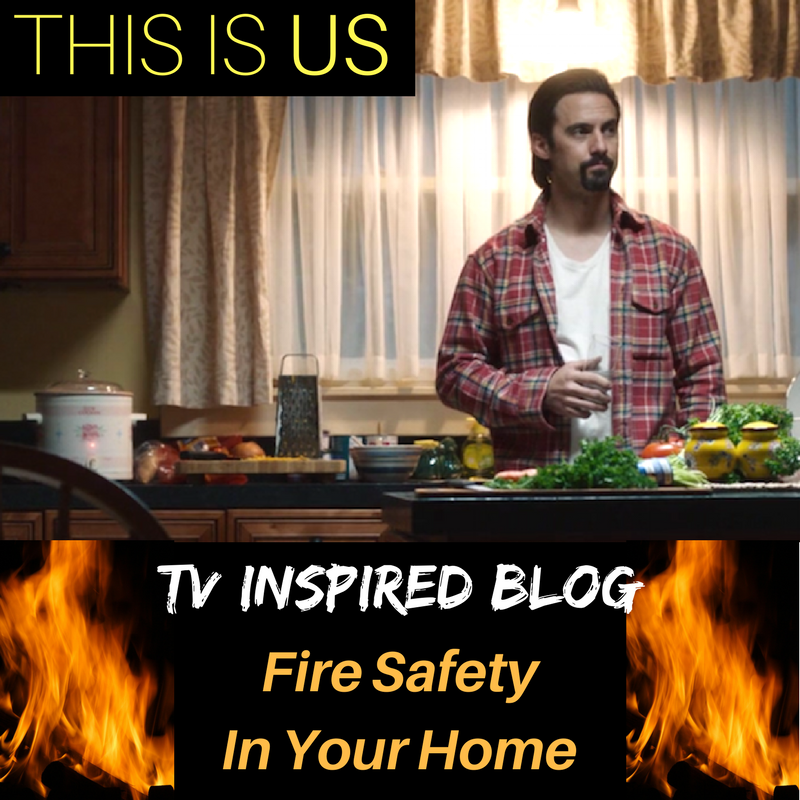 If you’re like the rest of the population who seems to be obsessing over the TV show, “This Is Us”, you’ve recently seen one of the characters experienced a fire in their home. Since it’s such a big topic in the media right now, we thought we’d take the chance to discuss fire safety in our own homes! The show make be fake, but fires in homes starting from cooking are incredibly real! In 2011-2015, U.S. fire departments responded to an estimated average of 170,200 home structure fires that involved cooking equipment per year. Almost half (47%) of reported home structure fires were caused by cooking. Keep matches and lighters out of the reach of children, up high, preferably in a locked cabinet. Closely supervise children, making sure that they are kept away from other fire sources, including lit candles, cigarettes, bonfires, and stoves. It is natural for young children to be curious and ask questions about fire, play with fire trucks, or pretend to cook. Use these opportunities to teach them about fire safety. Explain that fire moves very fast and can hurt as soon as it touches them. Tell them that this is why matches and lighters are tools for adults only. Teach young children to never touch matches or lighters. They must go tell a grown-up when matches or lighters are found. Establish clear rules and consequences about unsupervised and unauthorized uses of fire. Be a good example! Always use fire sources — matches, lighters, candles, fireplaces, and campfires — in a safe manner. Never treat them as toys, or children may imitate you. Talk with children about what their friends or other children are doing with fire. What are they seeing online in video games, on TV, in movies, and on social media? Teach them specific ways to resist the peer pressure to misuse fire. Give praise for showing respect and age-appropriate responsible behavior toward fire. Check out spark.org for more fun and fire safety education! Gasoline & propane Always handle gasoline in the home or propane-powered equipment cautiously. Medical oxygen Portable medical oxygen in the home has grown over the past decade. Portable fireplaces The fuel, device and open flame from these products can be dangerous. Portable generators The most common dangers with portable generators are carbon monoxide (CO) poisoning, electrical shock, and fire hazards. Home Grills In 2009-2013, U.S. fire departments responded to an average of 8,900 home fires involving grills, hibachis, or barbecues per year. This includes structure fires and outside or unclassified fires on home properties. Five out of six (83%) grills involved in home fires were fueled by gas while 13% used charcoal or other solid fuel. Computers Computer-related equipment accounted for 79% of the home office equipment fires and 67% of the non-home office equipment fires. Heating Equipment Heating equipment fires accounted for 15% of all reported home fires in 2011-2015 (second behind cooking) and 19% of home fire deaths. Smoke alarms provide an early warning of a fire, giving people additional escape time. When’s the last time you checked the batteries in yours? In 2009-2013, smoke alarms sounded in more than half (53%) of the home1 fires reported to U.S. fire departments. If you are at all concerned about the quantity of alarms you should have or functionality of your smoke detector, best practice is to have one in every room and one on every floor and to test the batteries once a month and replaced at least twice a year. $6.7 billion in direct damage, or 68% of total direct damage in structure fires. Since we are your Realtor, we know how much your homes mean to you. Our goal is to find you your dream home. With that, we have vested interest in your safety while you live there.